The wear and tear on your home from the outside elements each season is something you should never ignore as a homeowner. Wind, snow, ice, rain, and sun can cause damage over a period of time if left unchecked. 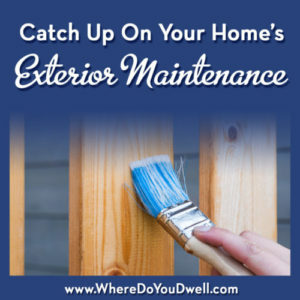 Whether you’re living in a single-family home or a townhome, you need to schedule regular maintenance that tackles the exterior of your home and your yard if you have one. Even for condo owners, you should make sure your association is taking care of these items too, especially if you are living in a smaller building and/or self- managed building. By keeping up with these seasonal tasks, you can avoid some costly repair bills from damage that could have been prevented. And, remember, that a well-cared for property can better retain its value and attract buyers when it comes time to sell. Your exterior and yard maintenance can include some DIY tasks or regular service appointments from professionals. Here’s a breakdown of what you should put on your to-do list each season for outside maintenance. Once spring arrives examine your yard and home’s exterior to see how everything looks and for any winter damage. As the weather warms up, you can catch up on certain outside tasks and prep your home before the summer starts to heat up. The spring can bring some heavy rains, so stay on top of tasks that can prevent water damage or drainage issues. Remove debris such as dead foliage and fallen branches and twigs that may be scattered in your yard. Clear out any growth or brush you don’t want. Be gentle raking and walking on your lawn at this time since new grass shoots will start to peek through. Check on exterior drainage systems and consider improvements to get ready for spring’s rainy season. To prevent costly water damage to your home, now is the time to make sure all of your drainage systems are operating properly and that they move water away from your home. Consider getting downspout extenders for gutters, having your landscaping slope away from your home’s foundation, or installing storm drains in your yard or even a French drain system. Remove leaves and debris from all area drains, gutters, and window wells. Always give your gutters a once over when it’s raining heavily to see if they are clogged and overflowing and hire a professional if needed. You may have to clean your gutters several times depending on your yard. Again, you want to prevent water damage to your home. Get your garden tools and supplies cleaned, sharpened and restocked. Remove rust and seal blades for pruning shears, hedge clippers, trowels, etc. Clean and restock garden pots, gloves, kneepads, watering cans. Don’t forget to get gas for your lawnmower. Purge and organize your garden shed to get rid of what you don’t need or use anymore and then arrange the space for easy access and a more orderly set up. Clean and prepare your patio or deck and any outdoor furniture or planters. Consider power washing to get rid of grime on some items that can withstand the pressure. Depends on what material you may have from pavers, concrete, slate etc. Or, give everything a good deep cleaning so the rest of the year, you can do a periodic wipe down. Clean the exterior siding of your home or schedule a paint job if that is needed. Depending on the siding’s material, you could get it power washed by a professional or rent the equipment. Wait for pollen season to be over before you tackle windows/screens and even screen porches. If your yard gets a layer of yellow pollen, then schedule a good washing later in the season. You can wash your screens and windows yourself or find a reliable professional to get the job done each year. Get your grill cleaned and repaired now. Scrub the grates with liquid cleaner, and wash the burners and covers if you have them. Don’t forget to get the tank filled if you have a gas grill, or stock up on charcoal for other grills. Little critters start to come out in the warmer weather so hire a pest service that can help you deal with ants, rats, spiders, or mice. Make sure your garbage is securely closed; and clean up any areas with debris that create an inviting home for critters. Winter weather can be harsh on driveways and sidewalks. Repair cracks whether you have concrete or asphalt. Sealing or resurfacing can give a driveway a bright lift. If you have pavers, make sure you know how to clean and re-sand or hire a professional. It’s still a good time to get your deck and patio power washed or cleaned, especially now that the pollen season is over. You can also protect them with new stain or sealant. And, you can have your home’s siding power washed or cleaned, depending on what the manufacture recommends. You can begin to plant summer bulbs, annuals, and perennials for beds and planters. Come up with a plan so you purchase only what you need and what works for the soil and sunlight in your yard. Cool spring weather early in the season is good for pansies in containers. Order your mulch in the early spring so your yard will look clean and crisp in the coming weeks. Once growth or buds sprout, you can fertilize and prune certain plants. You can transplant trees before they leaf out. Prune trees and shrubs that have any damage from the winter. You can’t prune azaleas, camellias and rhododendrons until after they bloom. You can prune nonflowering trees and shrubs. Your yard should be in pretty good shape by early summer if you’ve kept up with serious clean-up tasks throughout the spring. Remember that early June is a perfect time to make your yard more beautiful and a good time to finish up any preventative care. That way you’re set to relax for the rest of summer! Plan ahead and have a professional tree service come out regularly to ensure your trees are healthy and not diseased. You may need to have your trees trimmed if you haven’t in a couple of years. Summer storms and trees full of leaves with unstable branches can only bring disaster at this time of year. Continue to check on your gutters during any rainfall to prevent any water damage to your home. Remove leaves and debris from all area drains, gutters, and window wells. Weed and clean up beds of early spring plantings that have stopped blooming. Now is the time to clear out those wilted leaves and dead plants to make room for late-blooming flowers. Prune some flowering shrubs. Azaleas, camellias and rhododendrons can be pruned now that they are done blooming. As the temperature rises throughout the summer, keep watering your lawn, beds, and containers. Don’t water in the middle of the day with the hot sun, but do it in the early evening when it starts to cool down. Hire a pest control service to manage any seasonal issues if you haven’t done so already. A pest service can offer suggestions and solutions on how to deal with any problems, inside and outside of your home. The summer means more spiders and, yes, rats. Do your part and keep your garbage contained and clear out debris in your yard so you don’t have a tempting “home” for critters. The fall is another season that is perfect for many outside maintenance tasks. Plus, you want to prepare your home for the upcoming winter weather, which can be the harshest on your home. Clean out gutters and downspouts of leaves and debris. Depending on where you live, you may need to do this several times in the fall. Blocked gutters can cause water damage to your home at any time. As you get closer to colder weather, drain garden hoses and store them inside. Clean and then cover outdoor furniture (or store it inside) as you get closer to winter weather. The outside of your home is where harsh winter storms and cold weather can do damage. Get these outside tasks done starting in late November and early December so you’re prepared for any snow or ice storms. And, stay on top of certain tasks if a storm does happen. Make sure gutters and downspouts are cleaned out thoroughly of leaves and debris before the winter weather arrives. If your gutters are clogged, the water can freeze causing them to detach from your home. This can also cause major water damage to your home if left for too long. Prevent ice dams on your roofline. Remove snow from your roof as quickly as you can. Trim tree branches that hang too close to your home or electrical wires to avoid causing power outages. Ice storms can cause branches to fall; get rid of any dead limbs before the storms hit. Brush snow off of nearby trees since limbs can break from the weight of the snow and could damage your house or car. Drain outdoor faucets and winterize in-ground watering systems so you don’t get burst pipes inside your walls. Watch YouTube videos to show you how to do this; it’s easy and a must-do to keep your pipes from freezing. Stock up on pet-friendly salt or deicing treatments for your sidewalks, driveway, and porch to prevent slipping. Sometimes eco-friendly composite decks and stairs can be more slick and hazardous when ice forms. Be careful since it might not be obvious! Catch up on what maintenance you may have missed over the last few months and get moving on any late spring and summer tasks. Hope this list has helped you know what to prioritize and what to plan on doing now and in the upcoming seasons!